← Stacy London’s truth… ladies, you can learn something here. I thoroughly enjoyed Robert Goolrick’s debut novel, A Reliable Wife. It told a fantastic story, filled with coincidence, betrayal and heartbreak. (Review here.) Now comes Heading Out To Wonderful, which plows much of the same ground from a new vantage point. It’s a simpler plot line than Goolrick’s previous work: a stranger comes to town, falls in love with a rich man’s beautiful wife, pursues her, she cuts off their affair, and tragedy follows. The story is told by Sam Haislett, a small boy in a small Virginia town in 1948, and framed as a memory he is recounting to the reader. The novel is rich in character: Charlie Beale, the mysterious young man with a suitcase full of cash who comes to town, lives on the banks of the river, and gets a job with the local butcher. Will Haislett, the butcher, and his wife Alma, who are warm, decent, caring people. Sam is their son, adventurous and loving, but over-trusting and naive. Boatwright Glass, the self-made man who wants a wife to symbolize his success, and has to buy a girl from her father in order to make it happen. Sylvan Glass, the beautiful dreamer he marries, and her friend, the black seamstress Claudie Wiley. It’s also beautifully told. It’s filled with suspense, starting out with the mystery of who is Charlie Beale and where did he come from – a question that Goolrick never answers. Sam’s speedy attachment to Charlie, and the way his parents allow their relationship to grow, is unsettling. And of course, the moment that Sylvan Glass walks into the butcher shop, all readers know that trouble is on its way. But my own enjoyment of the novel, despite my appreciation for Goolrick’s insight into human complexity and the beauty of his recounting, was tainted by the desperation and ugliness at the heart of the story. Terrible people behave terribly, and the wonderful people do, too. And Sam, who is pure and trusting, is first brought to life by Charlie and then ruined by him. Bottom line: The book is well worth reading, and if you liked A Reliable Wife, you will be drawn to Heading Out to Wonderful. 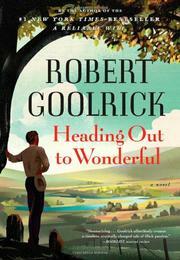 This entry was posted in Commentary, Review and tagged A Reliable Wife, Heading Out to Wonderful, Review, Robert Goolrick. Bookmark the permalink.